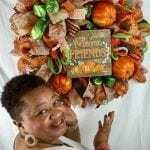 My name is Gwen Banks, owner of Gwen’s Custom Creations. I first found Julie on YouTube and I’ve been learning from her for over a year. Before working with Julie my biggest struggle or frustration in my wreath making was being able to make my deco mesh wreaths look full and not knowing where to start with florals which was my passion to learn. But since working together I have had huge break throughs in both deco mesh and silk flower wreaths, as well as centerpieces. Now I know that creating a designer quality product is possible in my wreath making skills or business. I would recommend Julie to others because of her knowledge and because of her ability to reach the beginner and the advanced wreath creator all at the same time. If you want to take your creating to the next level, Julie is your answer. She is such a down to earth and caring person and it shows in her teaching. I have learned so much because Julie is so willing to share of all of her tips & tricks. 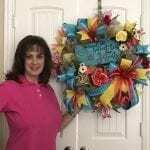 My name is Connie James owner of Connie’s Designs. A few years ago I was looking online for help to learn more about wreath making and was frustrated I couldn’t find exactly what I was looking for. Well unbeknownst to me my husband was looking for me as well. He was the one that found Julie on YouTube and said, this lady looks nice and I agreed, so I bought her e-book and that was the best purchase and stepping stone I could have ever invested in. I have been learning from Julie for 3 years now. Before working with her one of my biggest struggles in my creative business was florals and embellishments on a deco mesh wreath. Since working together, I have had a breakthrough in achieving this goal and have been very pleased with the results as are my customers. I could not have done it without Julie’s guidance. Julie, in the past year, has also started a Wreath of the Month Club that is fabulous! It is a must join group. I just love it and her creations are amazing. She gives you your supply list and her step by step video instructions and you make the wreath together. Even a beginner can create a beautiful wreath with her easy instructions and pleasant personality walking you through it all. Even though I now consider myself an experienced wreath designer, you never stop learning and Julie is always bringing new techniques and projects to our attention. I am also a member of Julie’s Inner Circle for Creative Business. We're learning many aspects of how to grow our business with Etsy, Pinterest, Facebook and other social media. Julie spends and enormous amount of time doing all the research for us so she can then come back and walk us through everything. One of the things I love about Julie’s teaching is that she is extremely detailed and goes through everything step by step and she doesn’t stop there. If you still have questions you can ask it in the group and she is always willing to help and answer your questions. Now that I am gradually learning how to implement these different business options I know anything is possible for my future business goals. God truly gave Julie a gift both creatively and in a business sense. She is humble and truly is grateful and appreciates all her members and shows it with her dedication and helpfulness to us daily. She is very professional but also likes to have fun, is very friendly, funny and you see her personality shine via her videos, especially her live videos. She is an inspiration to me and I know also to many others. I love her dearly and I would highly recommend Julie as your mentor for both wreath making and helping you grow your business. She will not let you down and I know I am there to stay!